Aditya Pratishthan is publishing an ‘Encyclopaedia of Devotion’ in Five Volumes in English, Hindi and Marathi.This kind of classical literary work, a crowning glory for Aditya Pratishthan, is not only unprecedented in World Uterature but also is a true epitome of Universal Oneness. Through Bhakti, the great Founders and Saints of Hinduism truly consolidated the glorious cultural unity of India. It transcends religion, cult, caste, creed and therefore, it is the best and constructive solution to build world community inspired with fundamental human values and true feeling of Universal Oneness. Bhakti is a path of devotion and spiritual love. It teaches everyone to bring forth spiritual unfoldment of the highest kind leading to the realisation of the Ultimate Ideal. Bhakti can guide people all over the world to lead an ideal life of peaceful co-existence, tolerance, co-operation and harmony. 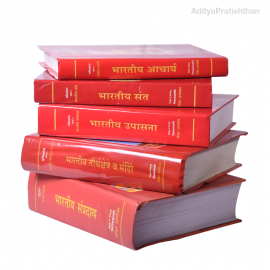 He proposed ‘Encyclopaedia of Devotion’ will be published in five Volumes in English, Hindi and Marathi. 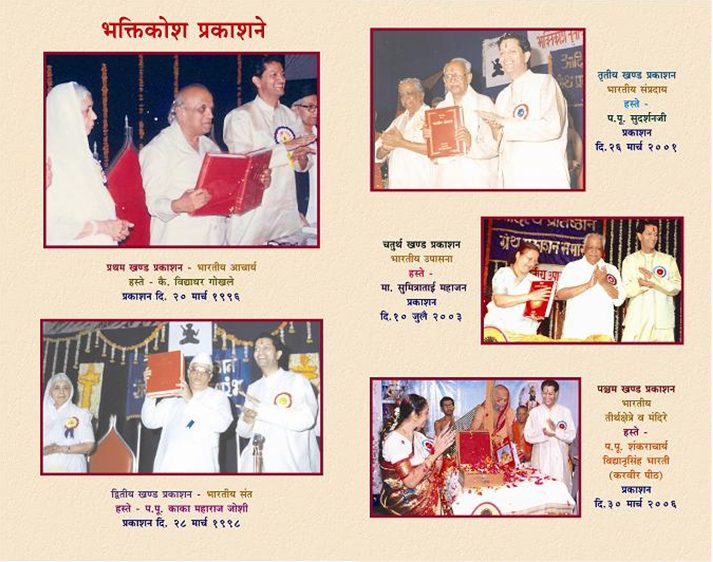 All the five volumes in Marathi are already published. Hindi and English editions of the first volume are also published, scholarly work for the remaining volumes is going on under Gurudev’s guidance. Aditya Pratishthan has taken upon another onerous task of establishing “Vaishwik Sant Vidyapeeth” (University of all Indian Saints). This Sant Vidyapeeth would dedicate itself to the study of our ancient Indian Culture, Indian Sampradayas and of course the literature created by the great Indian Saints.This Sant Peeth would also provide a platform for comarative study with other religions.The viyapeeth would be well equipped with Audio Visual Laboratory, Computer facilities, a well stocked Library, modern communication facilities including Internet connection, Lecture Halls and Auditorium, Meditation Rooms, Exhibition Hall and a monumental Temple etc.The research facility & guidance would focus on Universal Oneness through Bhakti, the glorious culture of India. 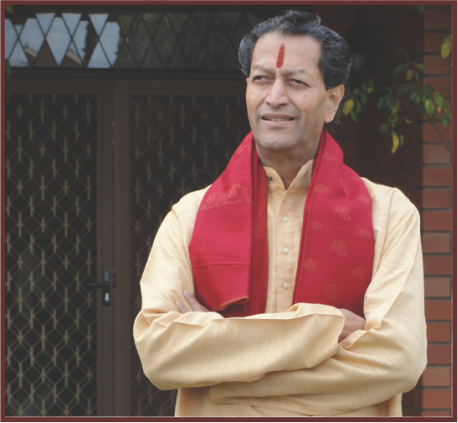 These two unique projects will contribute at large to re-establish fundamental human values in Indian society, bring about silent revolution by creating social awareness, appeal to the consciousness of an individual, make one and all respect the glorious Indian culture, admire and practise the preachings of Indian Acharyas and Saints.